The Braddock Carnegie Library turns 130 on Saturday. But that’s sort of the point: As Braddock Carnegie Library associate director Dana Bishop-Root says, a library created to meet community needs must always change to serve them. Braddock Carnegie Library 130th-Anniversary "Rebirth-Day Celebration." Noon-4 p.m. Sun., March 30. 419 Library St., Braddock. The library marks its 130th anniversary Saturday with a free community celebration. The event includes the official announcement of plans to further renovate the landmark structure by re-opening its long-shuttered music hall, expanding space for community events, and even adding an elevator. “On our 130th birthday, just as Andrew Carnegie dedicated the building, we’re going to rededicate the building, kind of, for this next phase,” says Bishop-Root. The library’s construction in 1889 marked the start of the famed industrialist’s career as a philanthropist. (His wealth from steel and railroads would build nearly 1,700 libraries across the country.) The Braddock library rose just blocks from the site of the first steel mill Carnegie owned, U.S. Steel’s still-operating Edgar Thomson Works, and it included not just a lending library but also a billiards room and a basement bathhouse for his millworkers (few of whom had indoor plumbing at home). Just four years later, a huge addition was built, including the 964-seat music hall, a gymnasium, a swimming pool and a duckpin alley. Patrons of Braddock Carnegie Library use the ceramics studio. The multiple functions followed Carnegie’s own dictum that the facilities should serve “mind, body and soul,” says Bishop-Root. That mission continues today. 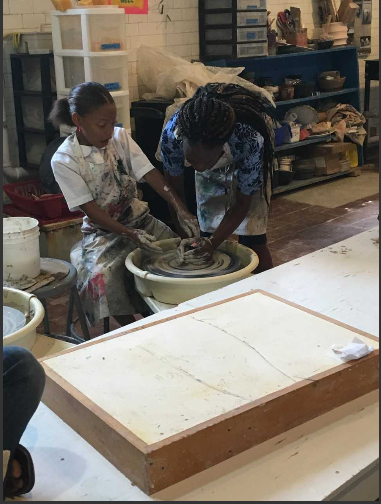 While the swimming pool is empty, and the music hall unused (except for the occasional film shoot or theater production), in recent years the library has added a community-accessible ceramics studio and print shop, a lending service for artworks, and more. “What we’ve discovered is, the more programming we have, the more people use the space, and that there’s a desire and there’s a need for that space,” says Bishop-Root. New programs are driven by community needs: The Braddock Carnegie Library now even lends out tables and chairs for community events, because neighbors said they had a hard time acquiring them. While Braddock was a thriving mill town into the mid-20th century, the library’s fortunes followed those of the larger community. Factors including industrial decline, white flight and pollution shrank Braddock’s population. While Carnegie built libraries, he didn't endow them, and the Braddock library couldn't maintain its building. In 1974, it shut down for nearly a decade, and was at one point slated for demolition. But starting in 1983, a grassroots group of residents called the Braddock’s Field Historical Society (led by the facility’s final librarian, David Solomon), bought the building for $1 and re-opened it, one room at a time. The library was named a National Historic Landmark in 2012. The library’s current mission, developed over the past five years as part of a master plan, is more equitable. It includes improving both physical accessibility – the planned elevator will be the library’s first – and plans to make the programming more welcoming to those in the wider community it serves, including neighboring towns like North Braddock, East Pittsburgh, Turtle Creek and Chalfant. The swimming pool will be repurposed as The Book Dive, a flexible space for community gatherings and small performances. The master plan also addresses the library’s financial sustainability, and making it adaptable to whatever the future holds. “This library has value to the community, and this library is valued by the community, and we’re so thrilled to be able to usher it into its next phase, and for the next generation,” says Bishop-Root. The anniversary celebration Saturday is free and includes hands-on activities in the art-making studios, live music and dance performances, GBBN Architects’ display of plans for the library, and more. Alarmed by the potential for American involvement in the Second World War, a group of Pittsburghers offered a unique proposition to halt German aggression. A Louisiana school cafeteria worker who saw a police officer struggling with a suspect and helped the officer subdue him is one of 18 people being honored with Carnegie medals for heroism. The Pittsburgh-based Carnegie Hero Fund Commission announced the award winners on Monday. The group grants financial awards to persons who, at the risk of his or her own life, save or attempt to save the life of another. "Carnegie’s Maid" tells the fictional story of an immigrant housekeeper who moves to Pittsburgh and accidentally ends up serving one of the city’s most famous families: the Carnegies.